Archbishop Lavigerie was a Christian of the market place, enjoying the historic arena of his own 19th century. Even if the Cardinal recited the Rosary, he expressed his devotion to Mary in spearheading undertakings such as the men and women Missionaries of Our Lady of Africa, the basilicas of Algiers and Jerusalem, and the resurgence of the Church of Carthage. He placed all these foundations in direct reference to Our Lady and to the Mission in Africa. Fr Joseph Vandrisse MAfr has readily taken the opportunity to sketch the 19th century’s historical, geopolitical and theological context in an attempt to capture the Marian devotion of our Founder. “Father Schynse, I presume.” So might have said Henry Morton Stanley, the adventurer (1841-1904), when he met Fr. Auguste Schynse (centre). In September 1889, Stanley’s Emin Pasha Relief Expedition stopped in the neighbourhood of Bukumbi Mission (Victoria-Nyanza South) and was supplied by the missionaries with linen, shoes and donkeys. Later on, Fr. Schynse accompanied incapacitated Fr. Ludovic Girault to Zanzibar, and on their way met up with the caravan of Stanley and Emin. At ten past one in the afternoon of the 12th May 1890, Father Simeon Lourdel died at Rubuga near Kampala (Uganda), surrounded by his confreres, Father Camille Denoit and Alphonse Brard. Thus the second of the five founders of the Catholic Church in Buganda (part of today’s Uganda), passed away at the age of 37; the four others were Archbishop Livinhac, Fathers Girault and Barbot, and Brother Amans Delmas. The Death of Father Lourdel happened at an important juncture in the pre-Colonial history of Buganda. Torn by religious and political rivalries, this kingdom had fallen prey to the colonial ambitions of Germany and Great Britain. 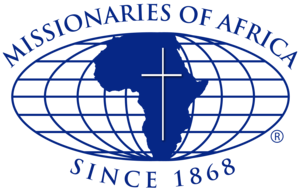 Unfortunately, the death of Father Lourdel coincided with the departure of Bishop Livinhac, Vicar Apostolic of ‘Victoria-Nyanza’ Vicariate, newly elected Superior General of the Society of Missionaries of Africa. Captain Leopold Louis Joubert, soldier and mission auxiliary, was born at Saint Herblon in France(Val de Loire). His parents were Jean and Marie-Rose Joubert. In July 1860, at the age of eighteen, the young Joubert left school in order to join the army being raised by Pope Pius IX for the defence of the Papal States. He served for eleven years in the Pope’s Franco-Belgian battalion. Wounded at the battle of Castelfidardo in 1860, he spent time in a Piedmontese hospital, but returned to Rome in 1861. Joubert was on garrison duty until 1865 and elected to remain in Rome as a papal Zouave when the French left Italy in the following year. Joubert saw action at the Porta Salaria when the Piedmontese marched on Rome in 1870. After the disbanding of the Zouaves, Joubert sailed to Algiers in 1880 and offered his services to Cardinal Lavigerie, founder of the Missionaries of Africa (White Fathers). 21/12/1860: Reverend Father Lavigerie, director of the Work for the Schools of the East, returned from Syria where he had gone to distribute charity. He passed through Rome, was received by Pope Pius IX, and on 25 August 1861 he was appointed an Auditor of the Rota. 30/10/1861: He took up residence in Rome, in the Palazzo Savorelli, in the Piazza degli Santi Apostoli. Mgr Baunard says of this palazzo that it had a modest façade, on the opposite side of the modern Via Nazionale.